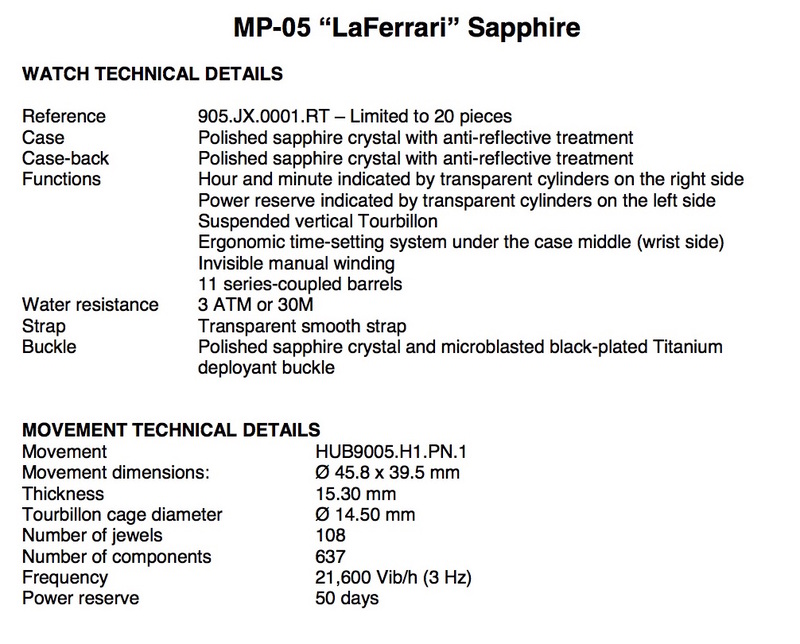 The MP-05 LaFerrari Sapphire case is carved out of sapphire and its movement appears suspended in mid-air. 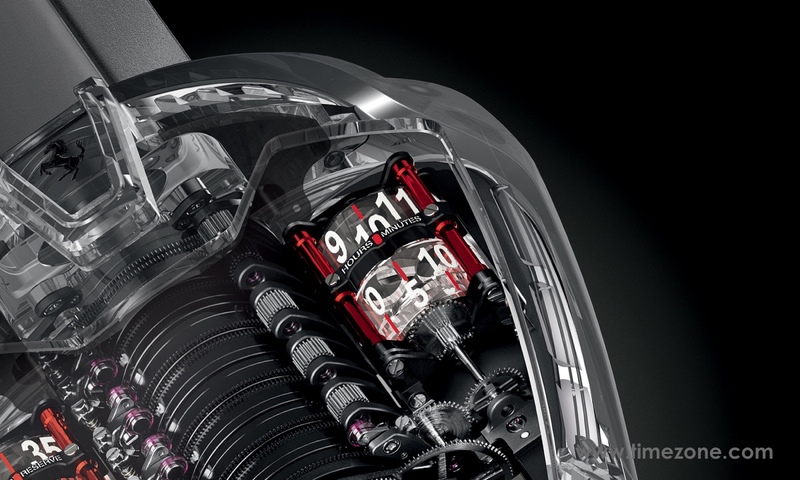 All the details of this record-breaking movement can be admired from all angles. Unveiled in 2013, the original MP-05 "LaFerrari" paid tribute to the eponymous supercar and showcased its unique and ultra-complex architecture. 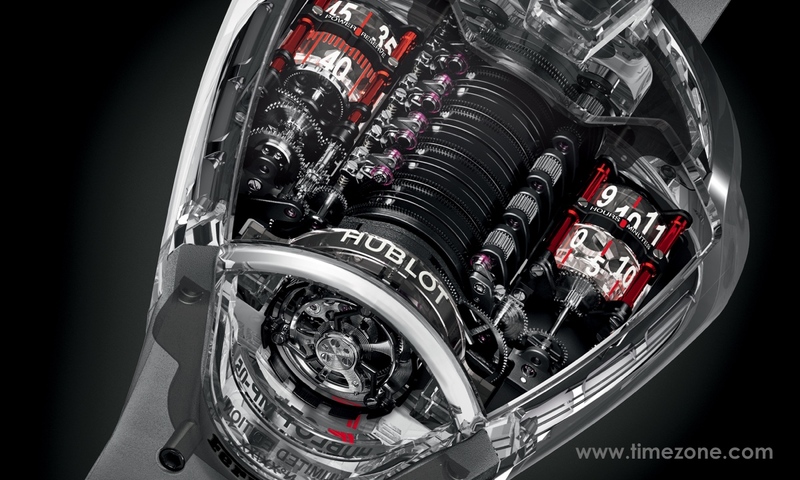 The lines of the MP-05 LaFerrari are the result of close collaboration between the designers and watchmakers working on the Hublot movement and Ferrari's design director, Flavio Manzoni. 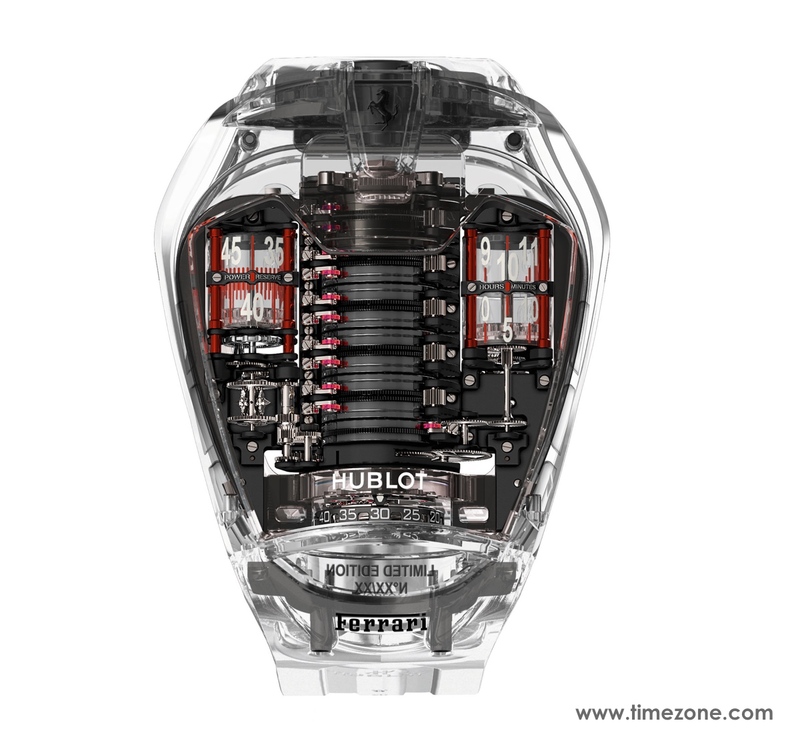 The movement itself was fully designed, developed and produced by the Hublot Manufacture engineers and watchmakers. A record-breaking technical feat. Its tourbillon boasts an impressive 50-day power reserve thanks to its 11 series-coupled barrels set in a spine formation down the centre of the watch. 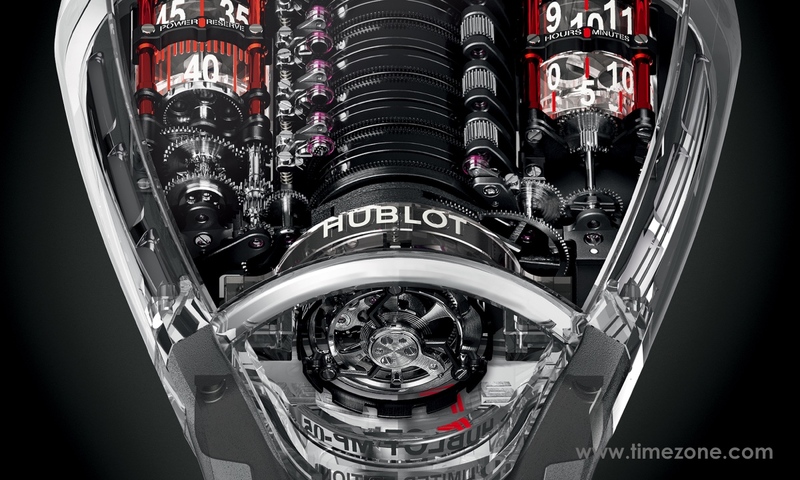 Its movement broke the record for the highest number of components for a Hublot movement to date 637 in all. Boasting a futuristic design, the construction showed off the bold shape of its movement, even in its original version. 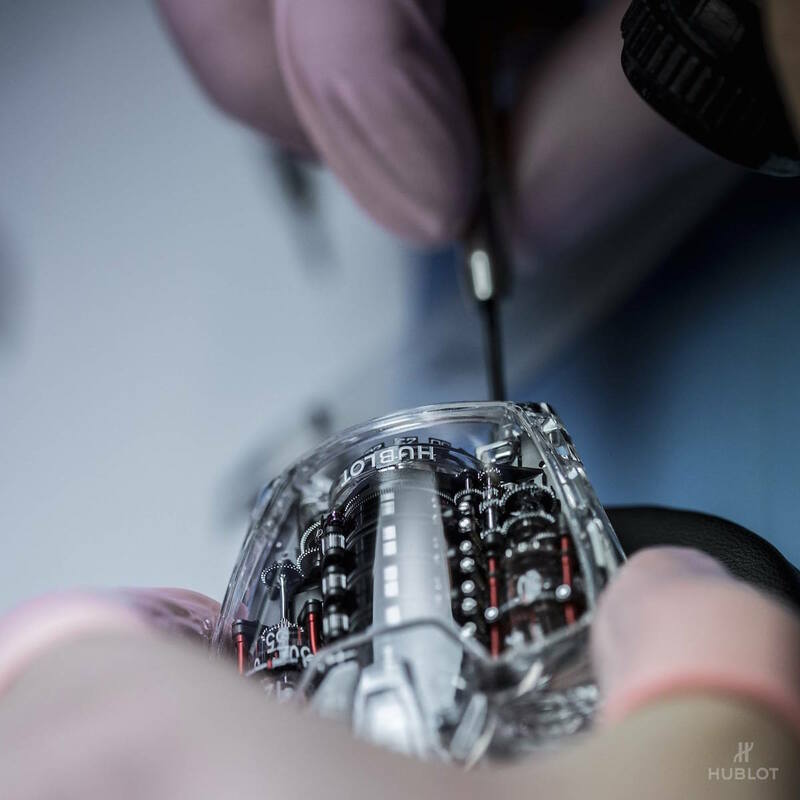 With the MP-05 "LaFerrari" Sapphire, the three-dimensional construction of the sapphire crystal case middle provides an exquisite setting for the movement. The movement appears suspended in mid-air. The sapphire case middle is composed of 7 components machined from 7 blocks of sapphire and involved over 600 hours work. Carving the case's ultra-complex architecture out of sapphire using 3D machining presented a further challenge. The result of 18 months' development weighs, a 53.5 grams case on the wrist. 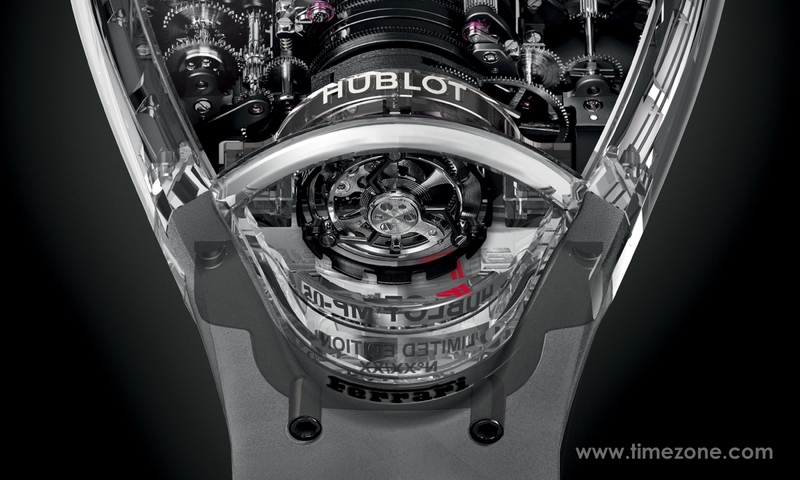 The HUB9005.H1.PN.1 movement features 637 components and a suspended vertical tourbillon. 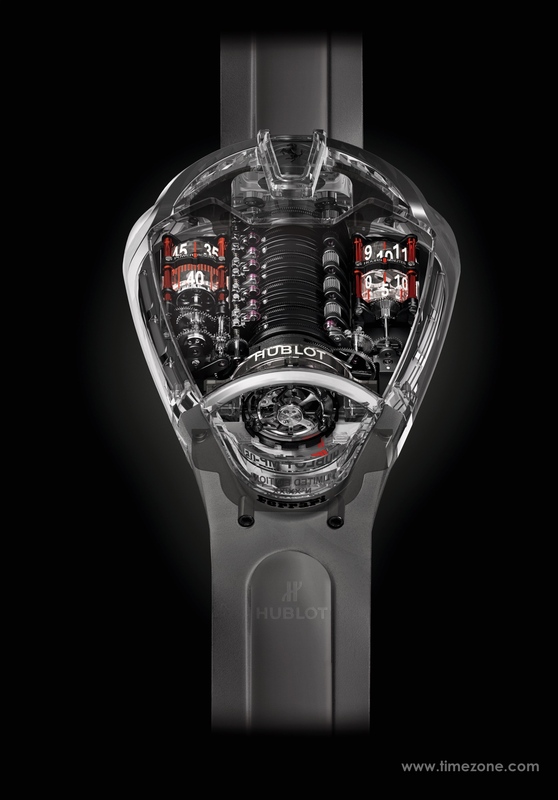 The bridge of the movement even bears the word "Hublot", which the engineers carved into this transparent material, the hardest after diamond. In its vertical position, the small second is displayed via a transparent cylinder fixed on the suspended tourbillon cage. 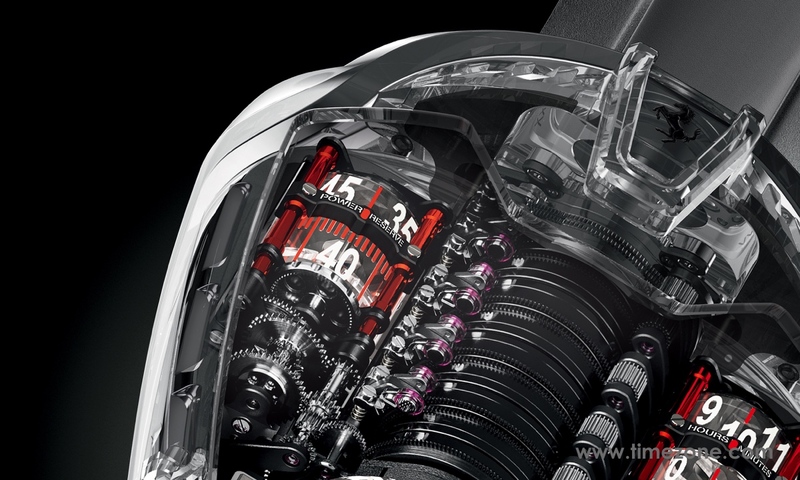 The hours and minutes positioned to the right of the barrels, and the power reserve to their left, are also displayed via transparent cylinders. Complementing its exceptional design, the LaFerrari Sapphire is teamed with a transparent silicon strap, with a clasp which also features components carved from sapphire. In keeping with the ultra-futuristic look of this timepiece, the watch is wound by a mechanism using a miniature power drill, modelled on the tyre-changing tool used in Formula 1. A rare timepiece limited to just 20 pieces.